Dear Nicole, Is it possible change the variable with time? Such as add 1 for every second, so the variable changes the status by triggers. I tried to make the character looks like talking, without add a lot of shape. Any suggestion? Hi Wally - You could definitely do that - use a change state when timeline reaches trigger. As to whether you should do that... well, it'd be incredibly time consuming. 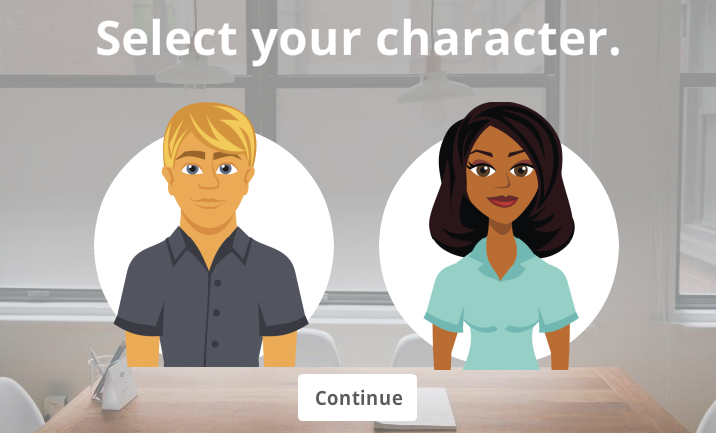 There are any number of animation programs (GoAnimate, Codebaby) that can create a workable avatar that looks like they're talking. You could invest dozens of hours doing it through triggers, and I'm not sure if it would start to break down after a while. Test it out on a 15 second clip just to see how much work it would be. Thanks!! Using animation programs is a good solution!! Well if we're talking unlimited time and budget, just have ILM do it with the same tech they used to bring Peter Cushing back for Rogue One. =) But here in the real world there are other options - if you don't like GoAnimate or CodeBaby (or others) that's cool, but dismissing them out of hand as amateur does a disservice to those products and worse, to anyone who might read your advice and not look into the alternatives themselves. I've had multiple clients use both - and not just small clients either. Well you probably are if you use those tools for animation. If you are animating and you aren't using arcs, anticipation, slow in and outs, follow through, then you are using the wrong tools. In lip Sync you have to be able to animate the face, the eyes as well as the mouth. The neck and head can also move. The right pose can also show the right mood he or she is in. Having a flapping mouth with no character is completely distracting and poor for the learner. If you don't have an animation background the best bet is to fade photos in and out in storyline. Hi. Yes i'm trying to do something similar and looked at this example above. When i try it i can see a slight flash from the first question to the second. In my file i had about 6 states for an avatar but the second you move onto another slide theres a 'slight' flash as it defaults to the 'normal' state. I then hid the normal state and had all the triggers saying 'if avatar=2 then change state to 2' etc but there was still the flash. I dont get why the first avatar (normal state) would flash briefly before it shows avatar 2 as the initial state is 'hidden'. Has anyone got the file above working properly ? Hello Paul, I seem to remember that I had a similar problem. Have you tried publishing your project and running the published course? I don't think the flicker occurs in the published course but does in the test environment for the course. Sorry Paul I don't think that I can help you further. I've just checked the project file and I'm doing the same as you - set image to hidden, change to normal (Jaz) or Tom or Sara (I'm using 3 avatars) depending on the variable. It does flicker if I test within storyline but our html5 version currently on the web doesn't seem to have the flicker https://www.keele.ac.uk/hltutorials/informationskills/checkyourskills/story_html5.html Just checked the flash version and that does flicker!!! Can anyone else help? Hi Paul, Something you might consider doing to remove the flash is to remove the character altogether from the "Normal" state (so that it's completely blank and empty, the normal state) and simply add a new custom state for each of the characters. If the Normal state has nothing on it, the flicker should stop happening. The reason the flicker happens is because it takes a second for Storyline to "read" the trigger and, for example, set the character to the Hidden state. Hey I haven't tried to see if I can follow this video yet but, if it is meant to show those who can't already do it, perhaps you could consider slowing down just a little - particularly when showing how to DO what the voiceover is INSTRUCTING. Just a thought. Had a go and created slider and states and it works very well. Shame we can do it a slider for each area. Such as slider for hair style, Slider for outfit etc.